My oh my... we've surpassed the $18,000 mark, meaning that the Official Epic Death! Dice Tower is now available to all backers as an optional add-on! Now, unlike other stretch goals, this one works in a different way. If you're interested in picking up one, you'll need to add $25 to your pledge. Simply go through the backing process again and adjust your total, then once the campaign has finished we'll be in touch. Of course, the more dice towers we can order, the cheaper they'll be - should twenty people desire these fine pieces of gaming ephemera, the price will drop to $20. I Changed Pledge..Missed The Part About Indicating It Here...TheDiceTower Looks Awesome. I'll have an EPIC dice tower please! Added $20 for a dice tower. I have also added $20 for a dice tower. Added $20 for a tower. Added $20 for dice tower. Count me in as well! I have added $20 for a dice tower. OK, I think we can safely say that there's enough interest to warrant the dice towers at $20! Thank you all once again! Of course, all this is helping us get ever closer to the $20,000 mark which means that those custom dice are getting tantalisingly near. We're putting together plans for stretch goals past the $20k mark, but if we have a day or so of delay in putting things together, please accept our apologies in advance! Threw another $20 into my pledge. MEEEEEEAAAD! Added $20 for a Dice Tower. Pretty sure there are 20 people interested. I'm also in. I only put +$20 as I am fairly confident that we will hit 20 people easily, but if we end up stagnating at 18 for some reason, I'll add the extra $5. I'm definitely in for this, the dice tower looks great. 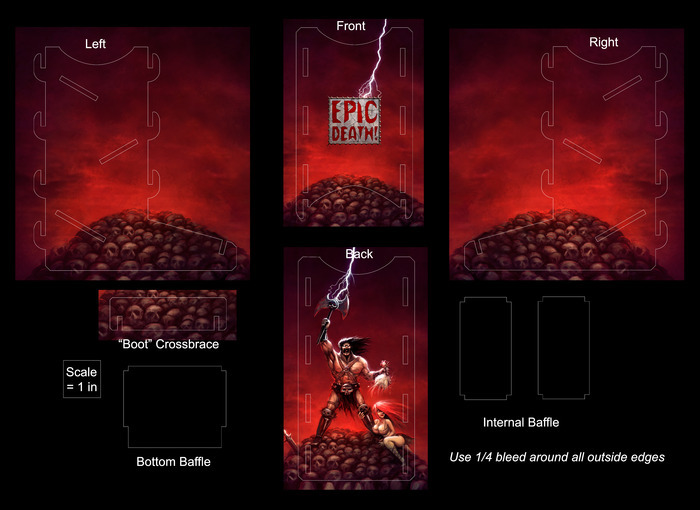 And seeing as this will be the first ever dice tower, might as well make it an Epic Death dice tower. Changed my pledge to include the dice tower as well. Well Im in for a dice tower as well now. Updated my pledge as Its the only way to be sure it will be EPIC! BTW, what is the size of it? Dice Towers Rule. 1 for me please. Hey all, the dice tower will be made from wood! @ Dheyrdre: You drop your dice down it and they roll down the tower. Its basically a neat and tidy way of rolling lots of dice. What material is the tower made of? Will it be delivered at the same time? No extra postage costs? In for 1. Im certain we can sell at LEAST 20 of these! Sorry my ignorance, but can someone tell me what a dice tower is? That looks great. I'm in. I'm also in for this. Which material is it made of and for shipping to Europe, additional shipping costs?